Outline: Adam, Noah, Job, Abraham. 24 sections. It has a picture book to go along with the recording. This is a Simple, Long version. God made the sun, the moon and the stars. God made the ground and the sky. He made the mountains and the sea. He made the trees, the grass and all the food we eat. God made all the fish and all the birds. 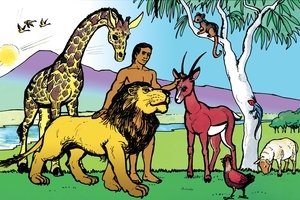 He made all the animals and insects. Then God made a man. God took some earth and made it into a man's body. Then God breathed into the body and the man became alive. God called the man Adam. When God made all the things in this world, He saw that all these things were good. 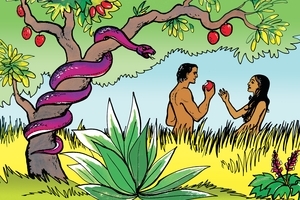 He made a fertile garden (very good place) for Adam to stay, where there were beautiful trees, good fruit and good food. God told Adam to look after the garden and the animals, trees and food. God brought all the animals and birds to Adam and he gave them their names. 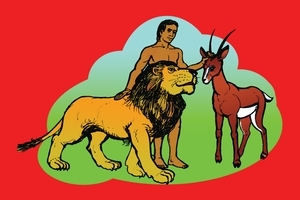 God gave Adam the authority to rule over all the creatures of the earth. But there wasn't a suitable helper for Adam. God said; "It is not good for the man to be by himself. I will make a helper for him." ...God made Adam go to sleep. Then God took a rib from Adam's side and He made the rib into a woman. Adam woke up and God brought the woman to him. Adam said; "This is good. The woman has come from my own bone." Adam called the woman Eve. (Eve worked with Adam in the good place God had made for them.) Adam and Eve were good people. There was no sin in them. Everything they did was good and right. They didn't ever get sick; all the time they were happy. (Adam and Eve were very happy in the good place God had made for them.) God told Adam and Eve that they could eat the fruit from the trees in that place. (It was very nice fruit.) But there was one tree in the center of the good place. It was called the tree which gives knowledge (to people) of what is good and what is bad. God said to Adam and Eve, "You must not eat the fruit from that tree. If you eat it you will die". Satan was also there. (Satan is the leader of all bad spirits and he is God's enemy.) Satan hated Adam and Eve because they were God's friends. So Satan tried to deceive them and make them disobey God. He wanted Adam and Eve to be unhappy and die. One day Satan came to Eve in the form of a snake. He told lies to Eve. He said, "If you eat from the forbidden tree, you won't die. You will become very wise. You will be like God Himself. Eve listened to Satan. She took some of the fruit and ate it. Then she gave some of the fruit to Adam, and he also ate it. Adam and Eve both disobeyed God. But when they did this it did not make them feel good or wise. No. They both felt ashamed and tried to hide from God. But Adam and Eve could not hide from God. God knew what they had done. He came and spoke to them. God told them that because they had disobeyed Him He must punish them. God told the snake that it would have to crawl on its belly, and that its descendants would always be enemies of the children of Adam and Eve. God told Eve that she would have much pain in bearing children and that her husband would rule over her. God told Adam that he would have to work hard to get food from the ground. Weeds and thorns would make it very difficult for him. Even though they had disobeyed Him, God still loved Adam and Eve. God killed some animals and used their skins to make some clothes for Adam and Eve. This was so they wouldn't feel ashamed about their nakedness. God also made a promise that one of Eve's descendants would crush the power of Satan. Remember that God's power is very great, and God is only good. If we disobey God, He cannot say, "It doesn't matter". God cannot change His Word (message). If we disobey God, God will punish us. But when we love God and obey His Word (message), He will help us. When God first made Adam and Eve they were God's friends. They always did things that pleased God. But then Adam and Eve rebelled against God. They disobeyed God and followed the lies of Satan. Because Adam and Eve sinned, many bad things happened. Adam and Eve's spirits died; that is, they were separated from fellowship with God. This meant that God did not control their lives any more. (He was not their guide like He was before.) Also, the natures of Adam and Eve became sinful. They began to do many bad things (like lying and stealing and getting angry with each other). Instead of God controlling their lives, they were now controlled by their own sinful nature, and by the power of Satan and his evil spirits. As well as this, they had to work very hard for their food. Many weeds and thorns grew up in the ground. 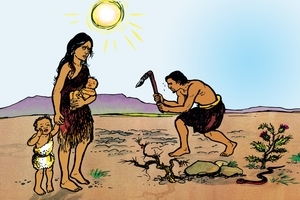 It was difficult for Adam to dig the soil and grown his crops. Later on Adam and Eve had children, but this meant pain and hardship for Eve as she bore these children. Another sad thing was that the children were all like their parents, they all had sinful natures, and therefore they did sinful things. The animals and birds had been friendly before, but now they became wild and frightened. They didn't want to stay with Adam and Eve any more. Later on, Adam and Eve grew old and their bodies died. This happened to their children too. Because Adam and Eve sinned, death came to all people. When Adam and Eve grew old and their bodies died. This happened to their children too. Because Adam and Eve sinned, death came to all people. When Adam and Eve disobeyed God many bad things came to them. Because of this many bad things have come to us too. But God did not forget Adam and Eve. God still loved Adam and Eve. He made a way to bring them back to Himself and to give them eternal life. God has not forgotten us either. God loves all of us. God has made a way to bring us back to Himself. God is able to change our nature and give us a new good nature. He can give us eternal life. But if we want God to change our natures, we must turn away from doing sinful things. Then we can ask Him to take away our sins and give us a new, good nature. All the time we must love God and obey Him. Over many years the descendants of Adam and Eve multiplied until there were many people (on the earth). But these people were just the same as their ancestors (parents). They disobeyed God and followed their own thinking. God saw that everything that the people thought or did was very evil. People did many bad things to hurt each other. God was very displeased (sad) about this. God said, "I see that all these people are very wicked. I will destroy them all." But there was one many whose name was Noah. Noah loved and obeyed God. God said that Noah was a good man and that He was very pleased with him. God said to Noah, "All the people have done many evil things. Therefore I will send a big flood and destroy them all. Noah, you must build a big ship. Then you, your family, and many animals too will all be safe." Noah and his three sons worked hard (for 120 years) building the ship. (Sound Effects - Noise of building.) Noah told all the people what God had said. (Noah said, "If you don't obey God, God will send a big flood and destroy you". But the people just laughed at Noah. (Sound Effects - Laughing.) The people didn't believe what God had told Noah, and they continued doing evil things. The heavy rain continued for forty days (1½ months) until the water covered every tree and mountain. 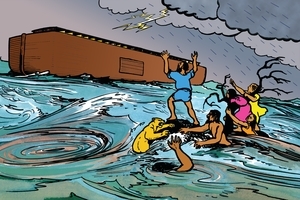 All the people and animals who were not inside the ship, drowned. These people did not obey God's message. They did not think God's message was true. This great flood shows us that God was very displeased with all the wicked things the people had been doing. God is displeased with us too when we sin. God has promised that all people will be punished for their sins. Noah and all his family were safe inside the ship. All the animals and birds that Noah had brought into the ship were safe too. They heard the terrible storm and saw the flood waters cover the earth, but they were not hurt by this. They were safe inside the ship. It is just like this when we come to Jesus. God has said that all people have sinned and the every one will be punished for their sins. But God sent his Son Jesus to save us. Jesus took the punishment for our sins when He died on the cross. If we turn away from our sins and ask Jesus to forgive us, He will do that. Jesus is like the ship that Noah and his family went into. When we come to Jesus we are safe (from God's judgment on our sin). 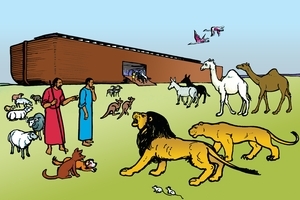 Noah and his family and all the animals stayed inside the ship for a year. Then the water dried up and everyone was able to come out of the ship, and walk about on dry land. God had cared for Noah and his family, and Noah was very thankful to God. So Noah took some animals and birds and killed them, and gave them as an offering to God. Noah made a pile of stones (into an alter), put the animals and birds on top and burnt them. God was very pleased with Noah and his offering. God said to Noah and his family, "I will never again send a flood to destroy all life on the earth. As long as the earth remains, there will be sowing and reaping of crops, cold and heat, summer and winter, day and night. These things will always remain. As a sign of my promise to you I will put my rainbow in the clouds. Whenever I see the rainbow I will remember the promise I have made to you." God told Noah and his family that they should have many children. God wanted them to spread out and live in many parts of the earth. Noah and his family did this. Now we are the descendants of these people. As we think about this story it helps us to understand that God's Word is always true. If God says He will punish those people who sin, then He will do it, just like He did when He sent the Flood. If God says He will save those people who love Him and obey Him, then He will do this too. When we see the rainbow in the sky, remember that God's Word is true. Remember to love God and obey Him. Then we will please God, just like Noah did. After the flood, the descendants of Noah became a large group of people. Some of the people gathered together at a place on the plain of Shinar. These people did not think much about God. They thought mostly about themselves. They decided that they would build a big city and make their own name very great. They worked very hard together and made many bricks to build their houses. They also built a tower (very high building). (this was to be a place where they would worship things other than God.) They did this to rebel against God, and to try and make their own name great. But God knew all that they were thinking and doing. God knew how to spoil their plans and how to take away their pride. God made different groups of people start to speak differently. This made it difficult to work together. Soon the people stopped the work they were doing on the tower (high building) and on their houses in the city. The people split up, according to their language groups, and scattered abroad to live in many different places. So, in that way, God stopped the people from rebelling against Him. God spoiled their plans and took away their pride. 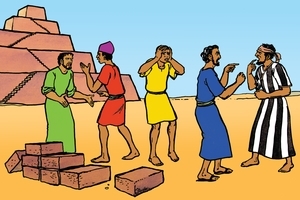 That place was called "Babel", which means "confusion", because there God confused the people's thinking and forced them to scatter abroad and live in many different places. This story helps us to realize that God knows all about us. Just as God knew what the people of Babel were thinking and doing, so God knows what we are thinking and doing too. God knows when we are happy or sad. He knows when things are going well for us, and when things are difficult. Also, this story helps us to realize that God rules over all things. Some people have great power and they rule over other people. But God is the One who rules over all people and things. God can change the thinking of people. He can also change the decisions made by people in places of government (authority). God can do this to stop people rebelling against Him. A long time ago there lived a man called Job. Job was a good man who loved God. He tried to please God in everything he did. He had nothing to do with evil. God was very pleased with Job. God had given Job many good things. Job had a large family of seven boys and three girls. He also had many possessions. He had many sheep, camels, oxen and donkeys and many servants. He was the greatest man in that country. Job's family was a happy family. They enjoyed being together and they often invited each other to eat together in their houses. Job would often pray for his children and make offerings to God on their behalf. At that time, God had a meeting with some of the angels in heaven. Satan was also at the meeting. God asked Satan if he had noticed the man Job, that Job was such a good man. Job loved God, obeyed His teaching and kept away from evil. Satan said that Job only loved God because of the many things that God had given him. Satan claimed that if all Job's possessions were taken away then Job would not love God, he would curse Him instead. God gave Satan permission to test Job by taking away any of his possessions. But God would not let Satan hurt Job's body in any way. Job did not know anything about this talk between God and Satan. This is the same for us too. God knows all about us. He knows everything we say and do. God is pleased when the things we do bring honour to His Name. We do not know all the things God had planned for our life. There could be hardship and suffering. We do not know. Hardship and suffering can come to good people who love God and obey Him, just like it can come to people who rebel against God. But we do know that we can trust God. He loves us and the things that happen to us are under His control. God uses these things to strengthen us, and so that we can help other people too. God allowed Satan to test Job and find out if he really loved God. Satan tested Job by taking away all of his many possessions. This is how it happened. One day, as Job was in his house, a messenger came running to him. He said to Job, "Some raiders (enemies) came and took away all your oxen and donkeys, and they killed all your herdsmen. I am the only one who was able to escape and come and tell you". While he was still talking to Job, another messenger rushed in and said, "The fire of God came down from the sky and burned up all your sheep. The shepherds were killed too, and I am the only one who was able to escape and come and tell you." This man was still talking to Job when another man ran in. He said, "Three bands of raiders (enemies) came and took away all your camels. They killed all your servants, and I am the only one who was able to escape and come and tell you." This man was still talking to Job when another man rushed in. He said, "Your sons and daughters have all died! They were all having a feast together in the older brother's house, when a strong wind blew on the house and the roof fell in on them and they are all dead. I am the only one who was able to escape and come and tell you." So Job lost all of his possessions and all of his children, all at the same time. Job was very sad about this, but he didn't say anything bad about God. Job continued to love God and to honour (worship) Him. Job said, "When I was born I brought nothing with me, and when I die I will take nothing away. God gave me everything I had and God has taken these things away. God's Name is only to be praised and honoured. When people suffer like that it is difficult for us to understand. We don't like to see people suffer. There are many reasons why people suffer, but only God knows them all. Some people do evil things, and this leads to their suffering, but good people suffer too. Jesus Christ (the Son of God), was a sinless Man, but He suffered many things. Jesus was tested in many ways, just like we are. This was so He could understand what our suffering is like, and so He could help us. Jesus also suffered and died on the cross to pay for our sins. Jesus suffered all these things so that He could help us. When we suffer, or our friends suffer, God knows all about it. He understands how we feel, and He can help us. There was another meeting in Heaven when God spoke to the angels and to Satan. God spoke to Satan again about Job. God said that Satan had taken away all Job's possessions and caused him great suffering, but still Job loved God. Job had not changed his thinking about God or said anything foolish about what God had done. Job obeyed God's Word (message) better than any other person. Satan said that Job would change his mind if he had to endure physical suffering. If he was made to suffer in his own body, then Job would curse God. So God gave Satan permission to test Job by hurting his body, but He would not let Satan take away Job's life. Soon after that, Satan caused Job to have terrible boils all over his body. This hurt Job very much. Job went and sat among some ashes and scraped himself with a piece of pottery. Job's wife was very upset because of Job's suffering. She told Job that he should just curse God and die. However Job said that was a foolish way to talk. We should expect not only pleasant things from God, but also things that are difficult and unpleasant. Job didn't say anything about God. He continued to love God and honour Him. Job had three close friends (Eliphaz, Bildad and Zophar). They heard about Job's suffering and came to see if they could help him. When they saw that Job's suffering was very great they were very sad and tore their clothes and cried. They sat down with him for seven days and nights without saying a word. Then they talked with Job for many days. They tried to understand why Job was suffering and what was the best thing for him to do. They all said that Job was suffering because of something wrong that he had done. If he would confess his sin to God then everything would be all right. Job knew that this was not true. He had not done anything wrong. (So, although Job's friends tried to help him, their talk only made him upset.) Then Job called out to God. He wanted God to tell him why all this suffering had happened to him when he had done nothing wrong. Do you ever feel the way that Job did? Do you have troubles and suffering and people do not seem to understand? Do you ever think that God may have forgotten about you? It is good for us to know that God knows all about us and He understands the way we feel. God doesn't ever forget us. God loves us and His plans for us are only good. God is pleased when we love Him and honour Him, even when we have times of trouble and suffering. God had been listening to everything that Job and his friends were saying. Then God came and spoke to them all. God asked Job many questions. God said, :"Where were you when I first began to make the world? Do you ever tell the morning when it should appear? Can you control the stars? (Do you give strength to the horse?)" God revealed His greatness and goodness to Job. As Job listened to God he felt that he was very small and God was very great. Job had nothing to say in answer to God. Job was ashamed (sorry) that he had said so much to try and prove that he was good. Job knew that although God was very great, He loved and cared for him. God did not answer Job's questions about his suffering, but Job was very happy. Job knew that he could trust God to do only good for him, even if this meant he had to suffer. God was not happy with Job's friends. God told them that they had not said the right things about Him, or about Job. God told them to bring offerings to Him and to ask Job to pray for them. If they did this then they would be acceptable with God again. Job's friends brought their offerings to God, and Job prayed for them. After this, God made Job well again, and gave to him many possessions. All of Job's brothers and sisters and friends came to see Job. They had a great feast with him in his house. 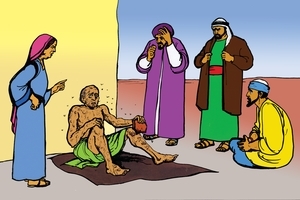 They all gave Job presents and consoled (talked kindly to) Job about all the things God had allowed him to suffer. Later, Job had twice as many possessions as he had before. He also had another seven sons and three daughters. Job continued to love God and honour Him all his life. Job was a very happy man. This story about Job is very important to us. Many times we are just like Job. Things happen to us and we can't understand the reason for them. (Perhaps we are sick, or perhaps someone has stolen some of our possessions, or perhaps a close friend dies.) Troubles come to us and we feel very sad. However, whatever happens, we know that we can trust God. God is very great. He watches over us, and cares for us. Whatever He does for us is for our good. Another thing we learn from this story is what is the most important thing in our life. Having many possessions is not the most important thing. Having good health and many friends are not the most important things. The most important thing is to love God and honour Him in all that we do. If we do that then no matter what troubles come to us we can be happy and content. We can also be a great help to other people too. One man who loved God and obeyed Him was named Abraham. One day God spoke to Abraham and said, "Abraham, I want you to leave your own country, your own relatives and your father's house and go to another land that I will show you". God also made a promise to Abraham. God said, "I will make you become the father of a great nation, and I will make your own name great. You will be a blessing, and through you every clan (tribe) in the world will be blessed." God wanted Abraham and his descendants to become a group of people who loved God and obeyed Him completely. Abraham believed God and left his own place to go to the place that god would show him. Abraham did not know where he was going, but he believed that God would be with him and lead him to the right place. Abraham took his wife Sarah with him, and also his nephew Lot. He also took all his possessions, his cattle and his servants. It was not easy for Abraham to obey God and to leave his own country and family. But Abraham loved God and wanted to obey Him even when it meant doing something very difficult. It is the same for us too. Following God's way is not always easy. But God wants us to obey Him in everything we do. God has promised to be with us, and to bless us. He will also make us a blessing to other people too. 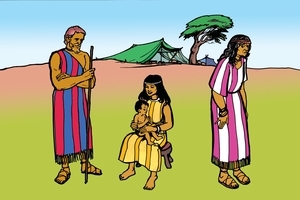 Abraham and his wife Sarah, and Abraham's nephew, Lot, settled in the land of Canaan. Abraham and Lot were both rich men. They had large numbers of cattle and many servants. After a while they found that there was not enough room for them all in the place where they were staying. 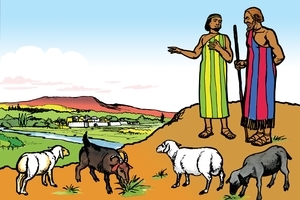 The herdsmen of Abraham argued with the herdsmen of Lot (about where the cattle should feed. So the situation was not happy). But Abraham was a wise leader, so he had a talk with Lot. Abraham said to Lot, "It is not good if there is quarrelling between us. There is not enough room for us to be together here. Lot, you choose whichever part of the land you would like to live in, east or west. Then whichever part you choose, I will go and settle in the other direction. Then we can live at peace." Lot stood with Abraham and they looked at all the land around them. The land to the east of them looked very good. There were lush pastures to feed the cattle, and also there were some important cities in that area. So that is the area that Lot chose (the Jordan valley). Lot moved there with all his cattle and servants, and settled near the town of Sodom. The people of Sodom were very wicked and refused to follow God's teaching, but Lot did not think about that. He thought it was more important to have the good land. Abraham was a generous man. He was the leader, but he let Lot choose the land that was best. Abraham wanted to have peace and harmony between himself and his nephew, and he believed that God would care for him. God had promised Abraham that all the land of Canaan would belong to Abraham's descendants. Abraham believed that God would do what He said. So, Abraham was content to stay where he was and to wait for God to do this in His own way. We can trust God to care for us. Lot and his family settled in the land of Canaan, near the town of Sodom. But it was not a good time. The leaders of the cities near Lot were fighting against (at war with) the leaders of other cities (because they did not want to pay taxes to them). But the people of the cities near Lot lost the battle. The people who won the battle took many of the other people away as prisoners, and they took all their possessions too. Lot and his family (were not involved in the fighting, but because they were in that area, they) were also taken away as prisoners. One of Lot's servants was able to run away. He went to Abraham and told him that Lot had been taken prisoner. Abraham had many servants who were good fighting men. He also had some friends with many servants too. They joined together and chased after the people who had taken Lot prisoner. (The people did not realize that Abraham was coming.) One night he and all his men attacked them, defeated them, and chased them away. Abraham rescued Lot and all his family and all their possessions. He also rescued all the other people from the cities near Lot. They were very happy as they traveled back to their homes. As they traveled back to their homes they came near the city of Salem. (The name Salem means Peace.) The king of Salem came out to meet them. His name was Melchizedek. (His name means king of righteousness (goodness)). He brought food and drink to give to Abraham and his men. 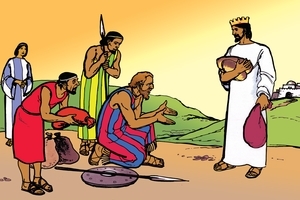 Melchizedek was a king who loved God, and helped his people to worship God. He said to Abraham, "May the blessing of God, the Creator of heaven and earth, be upon you, Abraham. Let us praise God, because He has helped you to defeat your enemies." Then Abraham gave to Melchizedek one tenth of the possessions he had recovered from his enemies. The king of Sodom also came to meet Abraham, and to thank him for rescuing all his people. He wanted to give Abraham a big gift, but Abraham would not receive it. Abraham knew that the people of Sodom were very wicked and did not honour God at all. He did not want people to think that the king of Sodom had helped to make him rich. Lot had settled near Sodom, the place of great wickedness, and as a result he and his family had many troubles. God's Word tells us that we should stay away from evil places and people. Instead, we should think about things that are good and honest and beautiful. We should stay with the people who love God, and do the things that please God. God's Word also tells us that Melchizedek is just like Jesus. Jesus is the King of Peace and Goodness. He is the One who helps us to honour God the Father. Abraham honoured God when he gave his fits to Melchizedek. We can do the same as we bring gifts to Jesus. Most of all, Jesus wants us to give ourselves fully to Him. 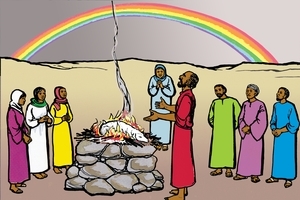 Abraham helped Lot and his family to go back to Sodom, then he and all his servants returned to heir own place. But Abraham was not happy. He and his wife Sarah were both old people, and still they had no children. Abraham thought that one of his servants would be the person to inherit all his property and possessions when he died. Then one night Abraham had a vision, and God spoke to him. God said, "Abraham don't be anxious. I am your shield (the One who protects you). I am the One who rules over all people and possessions, and you are My close friend." Abraham replied, "Yes, You are a great God, and all these things you have given me are good, but I still have no children, and when I die all these things I have will pas on to one of my servants". God said to Abraham, "No, it won't be one of your servants who inherits your land and possessions. You will have a son, and he will inherit all your things". 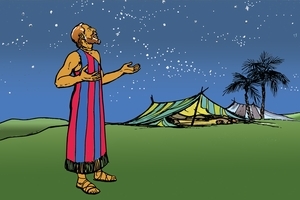 Then God told Abraham to go outside and look up at the night sky. God said, "Look at the stars, Abraham; can you count them all? Your descendants will be like that. They will be more than you can count." Abraham heard what God said and he trusted God and H would do what He said. Because Abraham trusted God like that, God said that Abraham was righteous man. Abraham made special offerings to God and God promised Abraham that what He had said would happen. Abraham was an old man, and his wife Sarah was old too. Do you think it was easy for him to believe that he and his wife would have a son? No, it was not easy, but Abraham knew that God was very great. Abraham believed that God could do anything He said. God is just the same today. He is very great, and He rules over all people and possessions. He has given many messages to us in His book, the Bible. God wants us to believe and obey what He says. Then we will please God, and, like Abraham, we will find that when God makes a promise to us He also makes sure it will happen. Abraham agreed to do what Sarah had suggested. Sarah gave her servant-girl Hagar to Abraham to be his second wife. Abraham slept with Hagar and she became pregnant. When Hagar realized she was pregnant she became very proud and arrogant towards Sarah. This made Sarah very upset and she spoke angrily to Abraham: "You are to blame for this trouble. I gave you my servant-girl as your wife, but now she despises me". In this story we see that Sarah became impatient because God had not given her a son. She tried to make God's promise come true with her own plan, but her plan only brought trouble to herself and all of Abraham's household. Trust God and carefully obey His word. Let god work out His plans for us in His own way. God had made a promise to Abraham that he would become the father of a great nation. Abraham thought that perhaps God would do this through Ishmael. But God said, "No". God said that Abraham and Sarah would have a son. 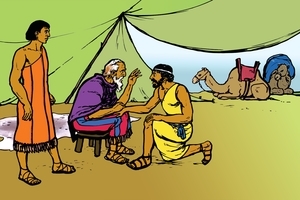 Abraham was sitting at the entrance to his tent. It was a hot afternoon. He noticed three men coming towards him. Quickly he got up and ran to meet them. He invited them to stay and rest awhile with him before they went on their way. 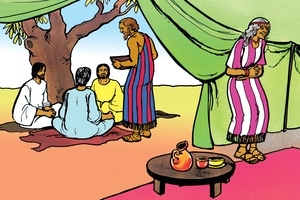 The men sat down in the shade of a tree and Abraham brought some water to wash their feet. He told Sarah to bake some bread for them. 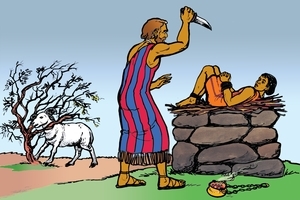 Then he killed a calf and prepared a meal for the men. Abraham realized that these were not ordinary men. One of the men actually was God Himself, in the form of a Man. 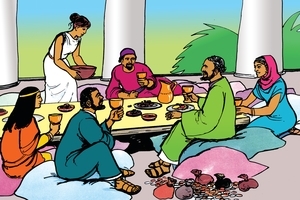 After the men had finished their meal they talked with Abraham. "Where is Sarah, your wife?" they asked. Abraham replied, "She is in the tent". God said to Abraham, "In about one year she will have a son". Sarah was inside the tent, but she was listening to what the men were saying. When she heard this she began to laugh to herself, because she thought she was too old to have a baby. But God said to Abraham, "Why did Sarah laugh? Why does she think she is too old to have a baby? Is there anything that God is not able to do? You will see that my Word is true, and next year Sarah will have a baby boy, just as I have said." Abraham and Sarah were surprised that God would come and speak to them in this way. It helped them to know that God cared for them, and God was assuring them that His Word was true. The three men who gave God's message to Abraham were ready to leave him and go on to the city of Sodom. God knew that the people of Sodom were very wicked. Because of that, God was going to destroy Sodom and all the people who lived there. (God also knew that Abraham was the man He had chosen to be the Father of a great nation. God wanted Abraham to be the sort of leader who would teach his descendants to live in the right way. So) God thought it would be good for Him to tell Abraham that H was going to destroy these wicked people. Then Abraham would realize that God was very displeased with people who wee willfully disobedient to Him, and that His judgment of sin was very serious. God told Abraham that He was going to Sodom to see if the people were as wicked as He had heard. This made Abraham feel very concerned. He knew that the people of Sodom were very wicked, and that God would probably destroy them. But Abraham was concerned about his nephew Lot. Abraham knew that although Lot was living in a wicked place, Lot himself was not sinful. So Abraham began to plead with God for the people of Sodom. Abraham said to God, "If there are fifty righteous people in Sodom, will you destroy them along with all the wicked people?" God said, "No, if I find fifty righteous people there, I will not destroy the city at all". Abraham continued to plead with God and finally said "If there are ten righteous people there, I will not destroy the city". Abraham thought there must be at least ten righteous people in the city, so he stopped praying to God then, and the three men went off towards Sodom. Early next morning, Abraham got up and looked towards the place of Sodom. All he could see there were huge columns of smoke and fire where the city had been. Abraham knew that God had destroyed the city, and that there had not been as many as ten righteous good people there. However, God had remembered Lot. God sent two men into Sodom and rescued Lot and his two daughters before the city was destroyed. God was pleased that Abraham had prayed for the people of Sodom. God wants us to pray for people too. God wants all people everywhere to become His children. He wants us to pray continually that people will come to Him, even if they seem to be very wicked. Let us remember too that God does not think lightly about sin. People who continue to live in willful disobedience to God will be sent to the awful place of Hell. They will stay there forever with Satan and all his evil spirits. Abraham and Sarah wee both very happy. Sarah had given birth to a baby boy, just as God had said. This was something that only God could do, because both Abraham and Sarah were very old. They called their son Isaac. Isaac grew up to be a fine young boy who loved God and obeyed his parents. Abraham and Sarah were very pleased with him. Then God tested Abraham. God wanted to know how much Abraham loved God, and how far he would go to obey God's Word. God said to Abraham, "Abraham, take your son Isaac, the one you love so much, to a place called Moriah. 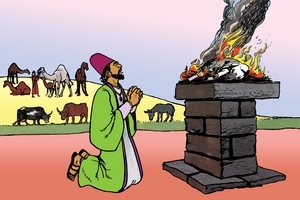 There offer Isaac as a burnt offering on an alter." Abraham was very surprised to hear God say this to him. Abraham knew that God was very displeased with people who offered their children as sacrifices to evil spirits. Abraham also knew that Isaac was the son that God had given to them. Isaac was the one whom God would use to make a great nation; a nation that would love God and obey Him. This would not happen if Isaac were dead, but Abraham knew that it was most important for him to obey God's Word to him. He had to trust God to do what was right. Abraham believed that if necessary, God could raise Isaac to life again. So, very early the next morning, Abraham set off with Isaac to go to Moriah. Two of Abraham's young men servants went with them. On the third day of their journey they came near to Moriah. Abraham told the servants to wait there. He said, "Isaac and I will go on further and worship God and make an offering to Him. Then we will come back." Isaac carried the firewood for the offering as he walked with his father, but he said to Abraham, "Where is the animal (lamb) for the offering?" Abraham said, "God will provide that". So they came to Moriah, and on the top of a small mountain there Abraham built an altar. Then he tied Isaac and placed him on top of the firewood on the altar. Abraham took a knife and was about to kill his son, when suddenly God spoke to him. "Abraham! Don't kill the boy! Don't hurt him at all. Now I know that you love God more than anything else. For you were willing to give up your son for Me." Then Abraham noticed a sheep caught up by its horns in a bush nearby. Quickly he took the sheep, killed it and offered it as a sacrifice to God. God had provided the sheep for him to offer instead of his son Isaac. So Abraham called that place "God provides". 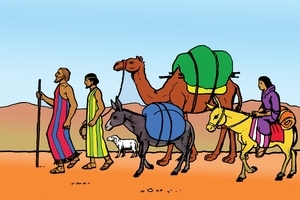 Then Abraham and Isaac returned to where the servants were and they all traveled home together. God was very pleased with Abraham. God had tested Abraham very severely. Abraham had trusted God to do what was right, and he had obeyed God's Word, even though it was a very difficult thing to do. We can always trust God to do what is right with us too. The important thing is for us to obey what we know God wants us to do. 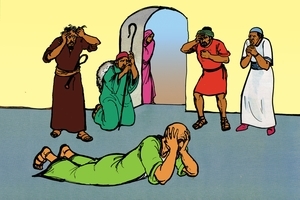 (Abraham's son Isaac grew up to be a man, but it was very difficult for Abraham to find a wife for him. The people of Canaan, where Abraham lived, did not love God or honour Him. Abraham thought that if Isaac married one of the Canaanite girls that they might turn his heart away from God.) When Isaac was forty years old Abraham decided that he must get a wife for his son. Abraham sent for his oldest and most trusted servant and spoke (solemnly) to him: "You must promise me that you will not let my son marry one of the Canaanite women. Instead, I want you to make a special journey to my own homeland (the place where I came from), to my own relatives, and find a wife for Isaac there. Then bring her back here." So the servant of Abraham set off with ten camels, all loaded with valuable gifts. He followed Abraham's instructions, and after a long journey came to the place that Abraham had told him about. But the servant didn't know where to start looking for Abraham's relatives. So he prayed to God and said, "God of my master Abraham, please help me to find the right woman to be a wife for Isaac. Here I am standing beside the water-spring where all the young women of the town come to get water. I will ask one of them for a drink of water. If she replies and says, "Yes, and I will get water for your camels too", I will know that is the right woman (because it would be unusual for a woman to want to do all that extra work of giving water to the camels of a stranger). The servant was still praying when a beautiful woman by the name of Rebekah came to get some water. Abraham's servant asked her for a drink, and she replied, "Yes, and I will get water for your camels too". When she had finished giving water to all the camels the servant asked her whose family she belonged to. She told him that she was the daughter of Bethuel and the grand-daughter of Nahor. The servant knew that Nahor was Abraham's brother, so he knew God had led him straight to Abraham's relatives. He bowed his head and thanked God for helping him to find the right woman straight away. Then he gave some valuable gifts to Rebekah and she ran quickly to tell her family what had happened. Rebekah's family were very happy to receive Abraham's servant, especially her brother Laban. They listened carefully as the servant told them about Abraham's desire to get a wife for Isaac from among his own relatives. They heard how God had led the servant to speak to Rebekah at the spring. So they agreed to let Rebekah go and become Isaac's wife. Then the servant gave many valuable gifts to Rebekah and to her mother and brother. The whole family was very happy. 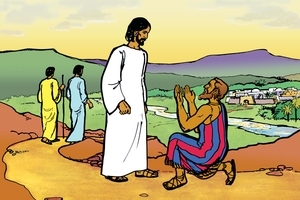 The next morning Abraham's servant began his journey to return to Abraham. He took with him Rebekah to be Isaac's wife. The servant was very happy to report to Abraham how God had led him to the right woman for Isaac. Isaac was very happy to have Rebekah as his wife. God knows all about us. He knows the matters about which we are concerned. Sometimes they are important matters, like finding the right person to be wife or husband. If we love God, and carefully follow His Word, He will show us clearly what we should do. God knows what is best for us, and we can trust Him to lead us. 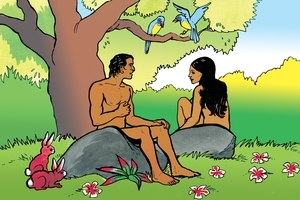 (In these stories we have heard how God made all things and how God made the first man and woman, Adam and Eve. Then we heard how Satan deceived Adam and Eve so that they disobeyed God. Sin came into their hearts and God had to send them away from the good place they were in. After that, life was much harder for them and their children. We also heard about Job and the many troubles he experienced, but how he continued to honour God. Then we heard about Abraham, a man God chose to begin a nation that would truly honour Him. In all these stories we heard that these people needed God to help them and to guide them.) God made a promise that one day He would send a person who would be able to help all people (and save them from the power of sin and death). God said to Eve that one of her descendants would crush the serpent's head. That is, He would defeat the power of Satan. God said to Abraham that through one of his descendants every nation in the world would be blessed. Other people who wrote in God's book also spoke about this person that God would send. One said that a virgin woman would bear a baby and this baby would be the Saviour. Another said that He would be a descendant of one of Israel's great kings, King Dave. 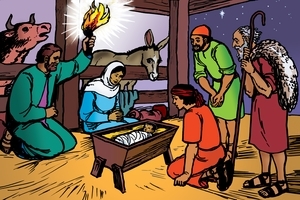 Another said that He would be born in the town of Bethlehem. All of these things came true when Mary gave birth to Jesus in a stable in Bethlehem. Mary was a virgin and she was also a descendant of King David. Jesus grew up to be a man and taught the people about God and did many great works. These all showed that He was the Son of God. He was the One that God had promised to send. He was the One who was able to save people from the power of sin and death. God always keeps His promises. We can trust Him to do that. His promise to us now is to give us His own Son Jesus as our Saviour and Friend. If we will turn away from our sins, we can ask Jesus to come into our hearts. He will save us from our sin and help us to live a life that pleases God. God's promise to Abraham came true when God sent Jesus to us. Jesus (is the Son of God, but when He came as a man He) came as a descendant of Abraham. Now any person from any nation can ask Jesus to be their Saviour. So in this way all nations of the world can be blessed through Jesus, a descendant of Abraham. God had promised the people of Israel that one day He would send them a Saviour. The Israelites waited many (hundreds of) years for that to happen. But when Jesus came, many of the Israelites did not realize that He would have to suffer and die. But many years before, God's Word had said this would happen. God spoke to Eve and He said that one of her descendants would crush the serpent's head, but also that the serpent would strike His heel. This meant that Satan would strike at the Saviour and make Him suffer, before He defeated the power of Satan. Isaac spoke to his father Abraham and said, "Where is the lamb to offer as a sacrifice?" Abraham said, "God will provide a lamb for the sacrifice". We know that Abraham did not have to offer his son Isaac as a sacrifice. But god sent His Son Jesus to be the sacrifice for the sins of all people. Many (hundreds of) years after Abraham, when Jesus came to the earth, one of God's prophets (messengers John the Baptist) pointed to Jesus and said, "See, there is the Lamb of God, who takes away the sin of the whole world". In order for Jesus to be a sacrifice He had to suffer, and die. Another one of God's prophets (Isaiah), said that the Saviour would have to suffer many terrible things, and take the punishment for our sins, so that we could be forgiven for our sins. God has said in His Word that all people have sinned. The punishment for sin is death. This means separation from God forever in Hell. There is no way we can pay for our sins. But God loves us very much. He does not want us to take that punishment of death. That is why He sent Jesus, and Jesus died on the cross. 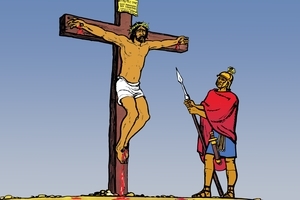 Jesus suffered and died to take the punishment for our sins. Now, if we are truly sorry for our sins, and we ask God to forgive us, He will do that. We must thank Jesus for dying for us. If we truly love Him, then we will obey what He says to us in His Word. After He had risen from the grave, He appeared to many of His disciples (friends). They were all very surprised. They did not think such a thing could happen. 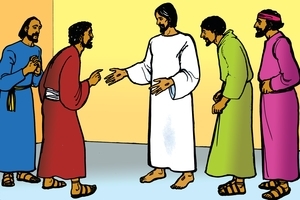 One disciple, Thomas, was not with the others when they saw Jesus. Thomas would not believe what they said. He said he had to see Jesus for himself. Later, Thomas was with the other disciples when Jesus appeared amongst them. Then he believed that Jesus had risen from the grave, and that He was truly God. Jesus said to him, "You believe and are happy because you have seen Me. It will be even better for those who believe in Me without seeing Me." The disciples of Jesus were not the first people to believe that God could raise the dead to life. Think about Abraham, when he was going to offer his son Isaac as a sacrifice to God. He believed that God would raise Isaac back to life again if that was necessary. Job too, who went through so many troubles, believed that even though his body would decay and die, later on God would raise him to life again, and he would see God with his own eyes. The prophet Isaiah spoke about how the promised Saviour would suffer and die, but he also said that the Saviour would live again and be given great honour. The story of Noah speaks to us about this too. We can think of Noah and his family in the big ship. They went through a terrible storm and flood that destroyed all other animals and people, and they were kept safe. Jesus too went through a terrible storm when He took the punishment for our sins, and died on the cross. But just like Noah's ship, He was not destroyed. He rose from the grave and defeated the power of Satan and sin. Now if we turn away from our sin, and come to Jesus, He will forgive us and bring us into God's family. (This also brings us into the family of Abraham, because God said that if we have faith in God just like Abraham then we become a true descendant of Abraham.) Jesus also promises to come into our heart and live with us forever. Then we have His great power to help us live in a way that pleases God. Jesus has also promised us that later on we will receive a new body, like His body, that will last forever. Then we will live forever with Jesus. GRN has recorded a version of this script in 457 languages and dialects. See full list. See different versions of this script in Afrikaans, Buhutu, Chinese Simplified, English: South African, French, French: West Africa, Herero, Indonesian, Kimwani: Ibo, Lomwe: Mozambique, Malagasy Merina, Ngonde, Northern Sotho, Pijin: Solomon Islands, Portuguese: Brazil, Portuguese: Mozambique, Roglai, Southern, Romanian, Russian, Sena: Mozambique, Shimaore, Shona, Spanish, Swahili: Tanzania, Takwane, Thimbukushu, Tok Pisin: PNG, Tonga: Malawi, Tsonga, Umbundu, Urdu, Venda, Xirima, Yao: Malawi, Zulu.